Last evening marked the final public engagement session in the lead-up to power developer EDP applying for Renewable Energy Approval for its 100-megawatt “Nation Rise” power project. 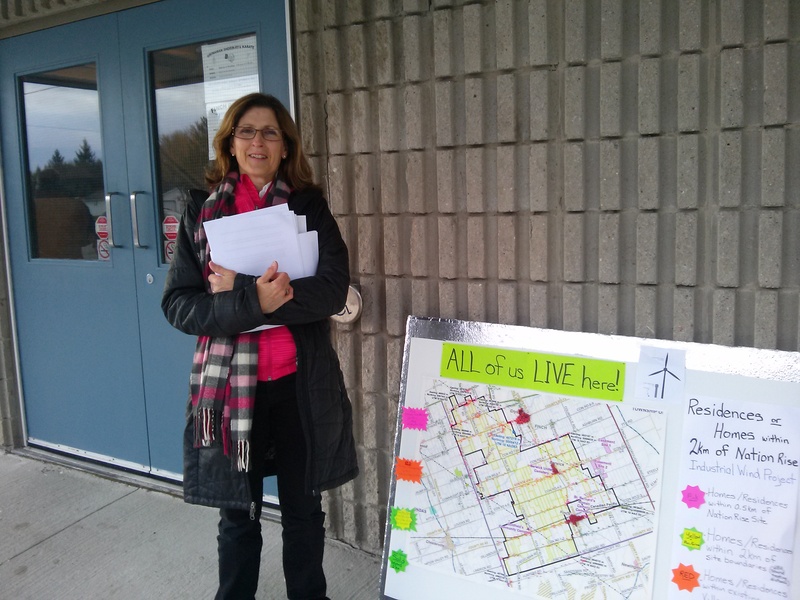 The local population has made it clear they are not in favour of the giant wind power project, which will cost the people $3.3 million over the 20-year contract with the IESO, and add more to everyone’s electricity bill. For power that Ontario doesn’t need. The Draft Project Description Report, under Wind Turbines states that the hub height will be anywhere from 100 to 140m. This is significantly higher than the 100m towers at your South Branch Wind Project in Brinston, where residents have filed complaints. How will the proposed 132m height affect the transmission of noise across our flat, relatively non-forested terrain and how will it differ when there is a hard ice/snow covering on the frozen ground and no leaves on the trees, a condition often found between late November and early April in North Stormont? In your noise report, you use a global ground absorption factor” of 0.7. This number is supposed to reflect the worst-case scenario, in our case when surfaces are hard/non-absorptive, like those we see repeatedly in winter, when the ground is frozen and following ice rain events (6 or more this past winter). Why have you not included a more accurate “0” absorption factor, which is our “worst case” scenario, or something closer to it, which reflects local conditions in North Stormont? Who are the engineers referred to in Section 3.2.6 of your “Site Considerations” Review? Will they sign, without “qualifying” their report, and assume professional responsibility for all information provided? Given that over 3,200 noise complaints were officially documented in Ontario from 2006-2014, (just as EDP’s South Branch was brought on-line) and from your prior experience internationally, how have you addressed noise and health complaints? Community members were particularly concerned that EDP, even though this was the last community event, still could not provide information on the exact equipment to be used, and how many turbines there would actually be in the project that could have as many as 34 50-storey structures. For more information or to provide support and donations for possible legal action, contact the Concerned Citizens of North Stormont here. EDP Renewables, headquartered in Madrid, has posted the site plan for its 100-megawatt “Nation Rise” wind power project, in North Stormont, about 40 minutes south and east of Ottawa. 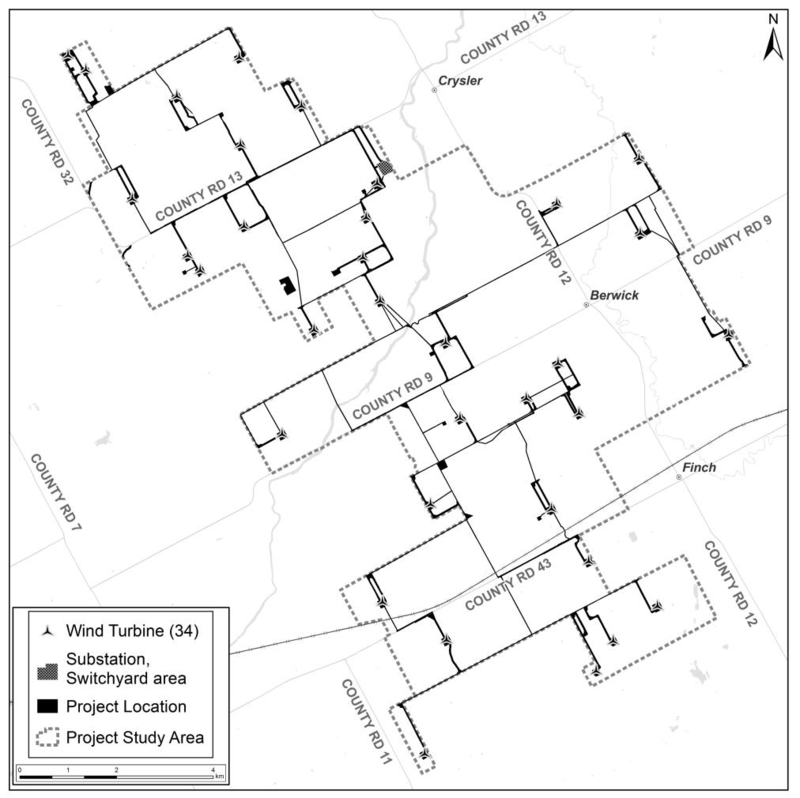 Project Location: The proposed Nation Rise Wind Farm will be located on private and public lands in the United Counties of Stormont, Dundas and Glengarry in the western portion of the Township of North Stormont, Ontario, and bounded to the south by the Township of South Stormont and to the west by the boundary of the Township of North Dundas. The north portion of the site is delimited by the municipality boundaries of Russell and the Nation. Courville Road and MacMillan Road are the east boundaries of the project. Dated at: the Township of North Stormont this 17th day of March 2017. Other project documents including the draft noise impact assessment are available on the Nation Rise wind “farm” website here. Residents interested in learning more about the impact of the power project on the area’s homes, environment and wildlife, and in supporting the group’s activities and legal fund, should contact the Concerned Citizens of North Stormont*, whose website is here. The 20-year contract with the Independent Electricity System Operator (IESO) will cost Ontario electricity ratepayers about $436 million. The Minister of Energy, Glenn Thibeault, has stated, meanwhile, that Ontario currently has a surplus of power (which is being sold off at prices below what power developers are paid). The Nation Rise contract could be cancelled under a pre-construction liability clause for $600,000, according to IESO documents. North Stormont is a Not A Willing Host community. *Concerned Citizens of North Stormont is a chapter of Wind Concerns Ontario, as is Ottawa Wind Concerns.